This is a follow up to a previous piece entitled, “Rule of law in Distribution system loss cap (June 7).” This sequel is prompted by three recent developments: (a) “NEA seeks expanded authority over electricity distributors (BusinessWorld, June 20),” (b) “DoE official backs NEA control over power distributors (BusinessWorld, June 21),” and (c) public hearing early this month by the Energy Regulatory Commission (ERC) to reduce the system loss cap of all distribution utilities (DUs). The ERC plans to allow higher cap (maximum rate of system loss) for electric cooperatives (ECs) compared to private DUs. In particular, the ERC plan is to impose a technical loss cap of 3.25% to 7.0% for three clusters of ECs but only 2.75% cap for private DUs and a non-technical loss cap of 4.5% of energy input for all ECs but only 1.25% cap for private DUs. The message is that the proposed new ERC regulation is to favor ECs, all under the supervision of the National Electrification Administration (NEA), which has the effect of allowing them to incur higher wastes that can be passed on to electricity consumers while forcing private DUs to spend more on higher capex so that their system losses are reduced to the barest minimum. The NEA and the various provincial ECs are not exactly doing well in consistently reducing the distribution system loss and raising the overall electrification rate in the country. The Philippines’ archipelagic geography is a contributor of course for the rather low electrification rate as many households in far away islands are off-grid and rely on generation sets administered by Napocor-SPUG and small private electricity sellers. More off-grid areas are now using solar. Still, the absence of 24/7 electricity in many areas covered by ECs as administered by NEA is a problem. When there are frequent brownouts, people use two things: candles and generation sets. Candles are among the major causes of fires in houses and communities while gensets are noisy and are running on more expensive fuel, diesel oil. 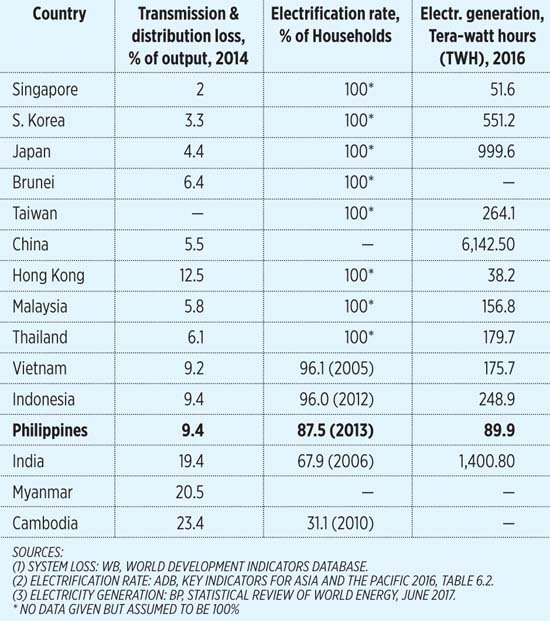 The Philippines’ low electricity generation compared to its neighbors in the region (column 4 of the table) is a result of combination of many factors, like the huge bureaucracies face by generation companies putting up new power plants, and rigidities in the electricity distribution system. Protecting the electricity consumers via lower distribution charge, lower system loss charge, and lower incidence of brownouts can be done via the following measures. One, both the ERC and the NEA should identify which are the most inefficient, lowest-rating ECs or DUs, push them to be corporatized (not exactly “privatized” because ECs are already private entities). These agencies, in turn, should serve notice to these ECs that if they fail to make their operations more efficient, then they will be corporatized. With these measures, these ECs will be forced to improve their systems loss, collection efficiency, employee-customer ratio, etc. Two, the government should remove differences in caps of systems losses between DUs and ECs. The ERC has to determine the increase in rates so that DUs can comply with their systems loss cap since they need to put up more expensive equipment to decrease technical systems loss. Having a different system loss cap for ECs and DUs means the ERC will not exactly be protecting the consumers but more of protecting ECs so that their inefficient if not outright wasteful operations are tolerated and rewarded with higher profit. Three, NEA should not aspire to supervise all DUs including private corporations. It is not exactly good at instilling financial discipline on all ECs as a number of them are inefficient and therefore lose money while charging high costs to their consumers (See “NEA offers P1.7-B loan window for distressed power cooperatives,” BusinessWorld, April 12). NEA in fact should step back and give more supervisory functions to the Securities and Exchange Commission (SEC) via ECs that were corporatized. After all, the SEC has more transparent, more universal corporate rules than NEA. Bienvenido S. Oplas, Jr. is a Fellow of SEANET and President of Minimal Government Thinkers. Both are members of Economic Freedom Network (EFN) Asia.